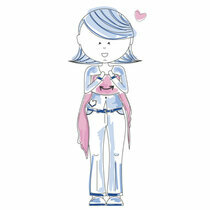 Pure Baby Love gives instructions to tie our stretcy and woven baby sling. 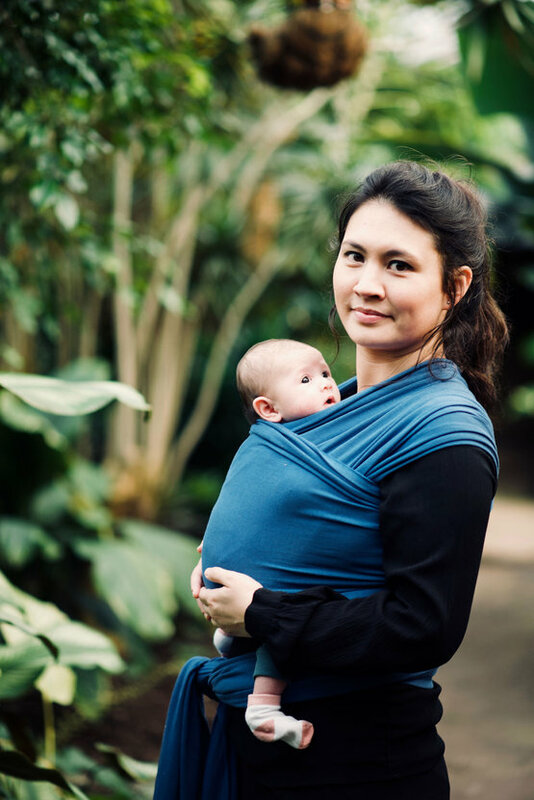 The basic tie to carry your baby on your belly with a woven sling, as from day one, is called the FWCC (Front Wrap Cross Carry). 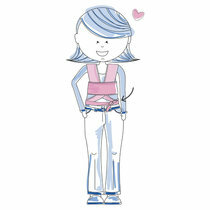 The basic tie to carry your baby with a stretchy sling from day one is called the PWCC (Pocket Wrap Cross Carry). However, our wonderful woven baby slings allow more ties. You can carry your baby on your belly, back or hip. Some ties can only be used for older babies for safety reasons. On the internet you will find many instructions. Although tying might seem difficult, practice makes perfect. Your baby might struggle a bit but don’t give up. Once you have tied the baby sling properly, almost all babies love it! A stretchy sling is perfect for your baby's first year! Click here to order your own stretchy sling! A woven sling is perfect for newborns and toddlers! In the middle of your Pure Baby Love wrap you will find a label. This is to mark the centre of the wrap. Hold this part against your chest. The rest of the fabric goes under your arms to your back. Cross the Pure Baby Love wrap on your back. 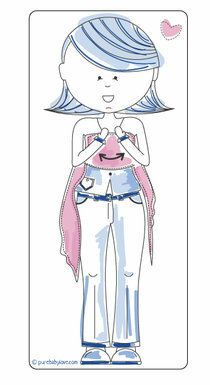 The fabric under your right arm, needs to be pulled over your left shoulder to the front and vice versa. Try to cross the wrap neatly. 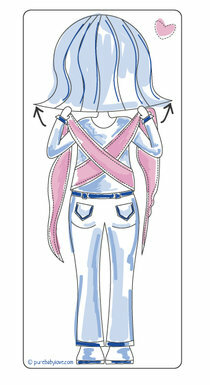 You can prevent the wrap becoming twisted by holding the upper edge, or top rail of the wrap fabric. The loose ends are now hanging over your shoulders in front of you. You take both ends through the horizontal part of the wrap that runs over your belly. Then tighten the wrap tightly. It is important the wrap is already as tight as a well fitting T-shirt. Then you cross the wrap at belly button height. Continue to tie the wrap around you until you reach the end. Make a double knot at the end. 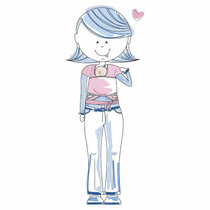 Place your child on your shoulder as if he/she has to burp. Then guide the legs through the crossed part of the sling, that comes from your shoulders. Then it is like the baby sits on the crossed part. First spread out the part of the fabric closest to your baby. You can feel this at the buttocks. Spread the fabric all over the back of your baby and from knee to knee. Then you repeat this with the other side. Now take the horizontal part of the wrap over the legs of your baby. This is the part you started with in the very beginning. You grab it easily under your armpit and pull it over the legs. Then you spread this part of the fabric all the way to the neck of your child. You can put the fabric you have left between you and your baby. Fold it nicely under your baby's buttocks. 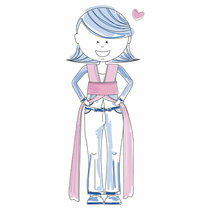 The wrap is knotted correctly when your child sits firmly against your body and it feels comfortable for you to wear. See if you can give a kiss on the head of your child; if so the wrap is tied at the correct height. In the middle of your Pure Baby Love sling you will find a label. This is to mark the centre of the sling. Hold this part against your chest. The rest of the fabric goes under your arms to your back. 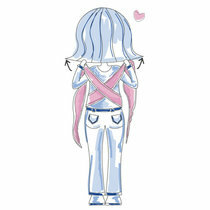 Cross the Pure Baby Love sling on your back. 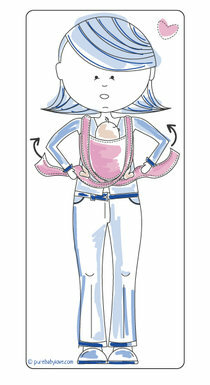 The fabric under your right arm, needs to be pulled over your left shoulder to the front and vice versa. Try to cross the sling neatly so you can tighten the wrap correctly in the coming steps. 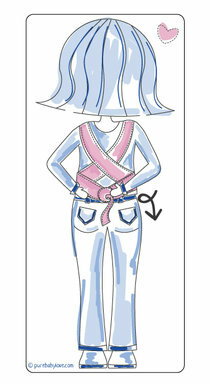 You can prevent the sling becoming twisted by holding the upper edge, or top rail of the sling fabric. The loose ends are now hanging over your shoulders in front of you. 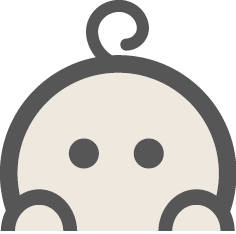 Hold your baby on your shoulder in the burp position. Guide babies legs into the horizontal part of the sling. Babies head needs to be under your chin, or close enough so you can kiss the top of his/her head. Pull the sling up over your childs back until it reaches the bottom of babies neck. Fold the excess of the horizontal wrap under babies bum, between you and baby to create a seat. 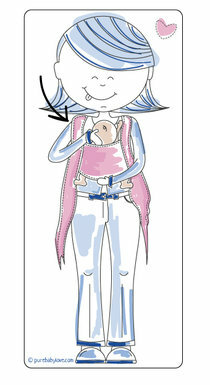 Ensure the sling spreads from babies bum to the nape of his/her neck and from knee pit to knee pit. Your child will sit in a natural 'M' or frog postion with knees higher then his/her bum. Please note: There is no need to force babies legs, especially with a small baby, as this is a natural position. Now it is time to tighten the sling around you and baby. For the up most safety and comfort, we recommend you tighten step by step. Firstly, on either shoulder pass, hold the top rail of the fabric (one closest to you) and pull to tighten the top rail of the fabric near your baby. Keeping this tension, gather more of the sling into your hand and pull to tighten. Do this all the way along the shoulder pass, keeping hold of the tension, until you feel the fabric tighten around your baby. Then repeat these steps with the opposite shoulder pass. Keeping the tension on both shoulder passes, bring them down to babies bum so that they sit in babies knee pits, cross the passes under babies bum and bring them under babies legs towards your back. Tie a secure double knot on your back. If you have fabric left you can also then bring it to the front again and knot here too. 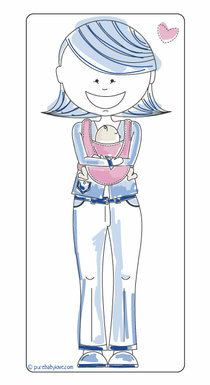 The sling is knotted correctly when your child sits firmly against your body and it feels comfortable for you to wear. 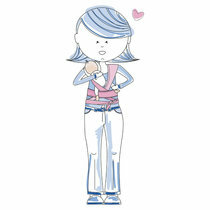 See if you can give a kiss on the head of your child; if so the sling is tied at the correct height. For extra comfort and head support you can make a roll at the top of the sling by tucking a muslin into the fabric of the top rail, behind babies neck. This provides some head support for very little children. Wearing your baby must be safe and comfortable for you both. Take a look on our website for all safety recommendations! We wish you and your child a lot of wearing pleasure! For safe babywearing, please read our safety instructions!